Backflip Records proudly brings you From This World To The Next, a deep ritual voyage featuring music from Italy, Costa Rica, Brazil, India, and Germany. These nine tracks will take you on a heavy ride through psychedelic visions of forests, goblins, and the spiritual realm. 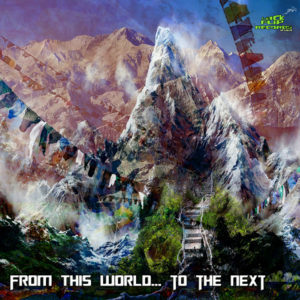 Descend slowly track by track into a darker and murkier realm before transcending and floating across the universe with these shamaneseque night-time psychedelic trance thrillers! Artwork by Dar Kapo. Mastered by Robert Hundt/Radioactive.Cake at Anti-Logic, Berlin. MP3 Download | FLAC Download | WAV Download · Download count: 17,479. Awwwhhhyeahhh Psyshastra/Backflip Records does it again \m/ some ballsy psy comin your way! Nocturnal Mars wears the crown. Great comp! As usual,Crooked Mind delivers a killer track, and also as usual, Absycho tears it up. (If you like that track, you should get the Sutra Lotus EP from Tripura yantra records.) Yes Nocturnal Mars is great, as well as the FluroNeuro. Favorite tracks: 3, 4, 5, 6, 7, 8; and the other three tracs are not badat all. Just heard Dar Kapo track on a proper sound system. What a rush! Hey guys!! Brillhant comments!! All so happy to share we music for the world!! Play it loud!!! Well normaly i am not dll music for a long time.But today i was need to download some compilation for to check some stuff, system. And downloaded this one!!! Well guys!!! BRAVO!!! Really killer music by every artist! Some tracks was to trip for me at some points, but maybe cas i am getting old :) ! Feels old good traditional dark psy with new technic of production from each artist. And label – good work, waiting for new releases! Very good. This album makes me meditate.